With an album that is simultaneously exceptional and dull, Bell Witch prove that talent and skills are not always enough. Even though they are not the first band to discard regular guitars and use only bass - both Om and Horse Latitudes did it before them - Bell Witch's arrival on the scene was one of the best things to happen to Doom. They managed to bring new life to the genre doing quite the impossible. They used the bass guitars mimicking normal ones, creating long, drawn out riffs that had a feeling of their own. The first full length was a major event - it sounded fresh and different from anything we had heard and it was simply amazing. They managed to pull off a brilliant sound using limited resources without any drawbacks. The sophomore could not live up to the debut but it was nonetheless a great listen from start to finish. Therefore, when the first details about 'Mirror Reaper' came out it seemed more than promising - it had one of the best cover arts I had seen recently, it was a single eighty minute mammoth song, with a unique structure - two halves that mirror each other. On paper, it seemed brilliant, so combined with the tragic story of the ex-member, reading the info in its pre-order stage made me very excited. And not only me - hype and raving reviews from any direction did not take long, as well as year-best-of list inclusions. The universal praise played a bad trick on me - when I first listened to the record I found it ridiculous. I do not mind repetitive Doom at all but this seemed to lack any substance. How can an album be so heavily praised when it could be summed it up in a "take a wonderful riff, some ambient note plucking and repeat for eighty minutes"? So it took me some listens to build a more sober picture of what we have here. As the mirror structure of the song took up quite a portion of the advertising campaign, I will not omit it here. The album comprises two parts. The first, 'As Above', has two awesome nearly twenty minute long sections with distorted bass guitars, and a ten-minute Ambient section in the middle. The mirroring part 'So Below' is the reverse - it starts with a mammoth twenty-plus-minute Ambient part, then the bass is back for nearly eight, followed by a final quiet part to close the album. Although there is indeed mirroring, it is there only on paper - as a listener you just perceive alternating sections of quiet versus loud music. There is just one problem - all the loud parts are practically the same and all the Ambient parts are practically the same. There is almost no progression or build-up through the whole record - flat parts follow flat parts. You have a few climaxes, a result of heightened tension in the riffs. You will not find crescendos here, as it is always subtle. Personally, I do not mind such lack of variation at all, as it can work wonders in Doom. What I call loud parts are not really loud at all, they just feature distorted bass guitars. It is all long, drawn out melodies, which are utterly mesmerizing. They are warm, mournful and drowning. They create a fantastic atmosphere of subtle melancholy and bleakness. This is the music neither of your mournful lover a la MDB, nor of your anguished drug addict dying in the alley a la My Shameful. It transcends earthly themes, and the occasional gentle chants help to reinforce these feelings. The riffs are patient, restrained, beautiful and extremely drawn out. When they are accompanied by grunts or blackish screams, it is pure bliss and you get a Doom experience of the highest caliber, if you would forgive this cliché. Unfortunately, we get a large portion of Ambient parts. Again, this is not typical Ambient, though it leaves that impression: It is more simple, unchanging notes on strings. Sadly, they are too long and although I am pretty sure that the band saw some meaning in them, this is music, the only thing that should count is the musical expression, and in that these are just poor. They are in no way obtrusive or unnerving, it is all quiet, almost pleasant, but they do not evoke any emotion, nor do they build any atmosphere. Though they might work in the transcending feeling I mentioned before, being kind of detached, you could hardly keep your attention fixed. They are difficult to skip (yeah, when you make one giant unskippable track make sure all of it is worthy - otherwise, be sympathetic to the listener and split into tracks). The ethereal clean vocals that usually accompany them, though a nice idea, do not elevate them to an enjoyable state. Underneath it all, you have an organ, which is a nice touch but personally, it does not really do much for me. 'As Above' is definitely the better part as the ten-minute ambient break is manageable and you have almost forty minutes of high class, pure, no-variation Doom. 'So Below' starts with an unbearably endless-seeming ambient section with no change, no direction, no emotion, no atmosphere. At the end, we get a too short riff section that is unable to make up for the previous one. I have read that the record requires concentrated listening. I do not know about that but I am sure it does not reward it. As background it is perfect as it is always pleasant, the distorted parts are wonderful, the ambient parts are so unobtrusive that you cannot really mind them (unless you are in a mood to listen to music). However, I cannot avoid the observation that this is basically ten minutes worth of music stretched to eighty. If someone argues that the band are playing the same riffs all the time, it would be hard to argue against because the overall impression is exactly that. I feel somewhat bad giving such a low mark for an album that has parts which are truly divine, but I need to judge the overall album. The truth is that there is just too much filler. 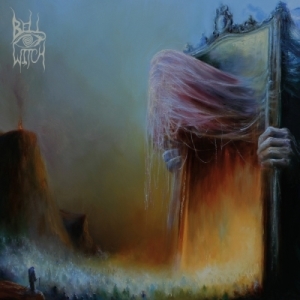 As for Bell Witch, I see this as a step in a steady downfall. This release should have been devastating for them. Instead, we have an "emperor's new clothing" type of media reaction, which could give them the wrong message that this direction is good. 'Mirror Reaper' shows their talent and skills to create sublime riffs, and I really hope that in future they'll focus less on gimmicks and more on the music. Visit the Bell Witch bandpage.